"A large portion of this money, we of course have now learned, was put toward the scientific enterprise of discovering a new planet in the solar system and then, no other way to describe it, blowing it up." 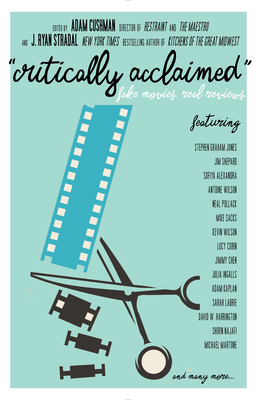 A fun and poignant collection of real reviews of fake movies by some of today's best and brightest writers. What seems like a funny, whimsical book, is actually an acute look at how cultural criticism works, what we find important or unimportant, and how movies help shape our world. Featuring writers like, Kevin Wilson (author of The Family Fang), Antoine Wilson (author of Panorama City), Comedian Sofiya Alexandra, and many, many, more. Adam Cushman is an author and film director. His novel Cut was released in2014 from Black Mountain Press. He is the director of the feature films Restraint and The Maestro. He is the owner of Film 14. ﻿﻿J. Ryan Stradal was born and raised in Minnesota. He now lives in Los Angeles, where he is an editor-at-large at Unnamed Press, fiction editor at The Nervous Breakdown, advisory board member at 826LA, and coproducer & host of the literary/culinary series Hot Dish. His first book is the New York Times bestselling novel Kitchens of the Great Midwest (Viking / Pamela Dorman Books, 2015). Voted the 2016 Adult Debut Book of the Year in the American Booksellers Association's Indies Choice Book Awards, Kitchens has been acquired for publication in twelve other countries and optioned by Warner Bros. for film & TV. His shorter work appears in Hobart, The Wall Street Journal, The Guardian, The Rumpus, The Los Angeles Review of Books, BuzzFeed, and Midnight Breakfast, among other places. He likes books, wine, sports, root beer, and peas.